News of game developers slashing thousands of jobs this week and shutting down studios, seems to dispute the notion of a recession-proof video game industry. But video games are indeed recession proof, it's the developers and publishers who aren't. "A recession is about the impact on sales, and layoffs are a function of profitability," said Wedbush Morgan Securities analyst Michael Pachter. The reason Microsoft is cutting 5,000 jobs, Sony is promising across the board lay-offs, Eidos is shuttering studios and Electronic Arts just let more than a hundred people go is because they've made some bad decisions, Pachter said. Not because their games aren't selling. "That's not the fault of the economy," he said, "that's the fault of bad planning." Pachter thinks that Electronic Arts, and others, are dumping too much money on research and development and not enough on the meat and potatoes of gaming. That's right, sequels. The companies that are sticking to the basics seem to be doing fine. And that's in line with what I've been hearing. EA is already trying to pull back from some of their more grandiose ideas. Like the Stephen Spielberg developed game code-named LMNO. I hear that while the game isn't officially dead, it has been mothballed indefinitely. I've also heard that EA-owned Black Box Studios, where I'm told about 120 people were let go earlier this week, was working on a new, deeply creative and innovative project. It's unclear where these latest cuts leaves the new game. Pachter sees the issues that EA faces as endemic in the industry, but he still maintains that gaming is recession proof. (Look at the jump in retail sales in December.) And why is it recession proof? "People have less money to spend so they shift from expensive to inexpensive entertainment," Pachter says. Which means lots more television, lots more Internet. And gaming? Gaming is a relatively affordable escape, with increased console sales driven more by guilt than smart fiscal planning. "The family who cancels the Disney vacation feel guilty and buy a Wii," he said. While developers need to be more careful these days, Capcom spokesman Chris Kramer still thinks the industry is healthy overall. "It's for the first time in a long time, people I know are losing their jobs. I was around in the last economic downturn and this economic situation does seem to be impacting games more deeply," he said. But Kramer says that with two major titles on the way for the publisher, Street Fighter IV and Resident Evil 5, this could be the most profitable fourth quarter in the company's history. Looking past these next two games, Capcom is starting to play around with the idea of downloadable content. The idea of selling add-ons and expansions directly to customers without the high overhead of producing a new game from scratch is certainly appealing to developers. Their new Street Fighter game, for instance, will be getting at least two least two downloadable packs. And why not do the same for Resident Evil 5? Expand the storyline and turn the game into a platform of sorts. "Currently," Kramer said, "we're evaluating DLC for Resident Evil 5." That's what Rockstar Games is experimenting with in Grand Theft Auto IV. 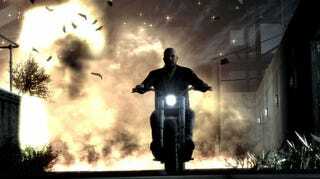 Next month the Lost and the Damned will allow gamers to return to game to experience new adventures in Liberty City. "I think all of the smart publishers are looking at ways to add-on to existing games," Kramer said. "It stems the flood of used game sales and every used game sale is money out of the pockets of the developer and publisher." Well Played is a weekly column about the big news of the week in the gaming industry and its bigger impact on things to come. Feel free to join in the discussion.